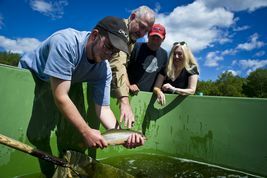 ﻿ Get a peek into the world of high-tech fish farming at a hatchery that has been stocking New Brunswick rivers for over 70 years. Learn the special techniques that are used to rear Atlantic salmon and Brook trout to various life stages in order to aid in research, production and education. Your host will welcome you upon arrival and provide a review of site safety practices. Once inside, you’ll learn about the history of the hatchery and enjoy a comprehensive video presentation on the important species conservation work being done at the centre. You’ll then receive a special tour the entire site, including the incubation facility and the holding tanks for stock destined to be released to the river. You can even feed the fish! A question-and-answer session rounds out this informative outing. Monday to Friday, 10:30 a.m. and 1:30 p.m.